Each day we are surrounding ourselves with dangerous equipment that could cause serious injures and damages if not used properly. 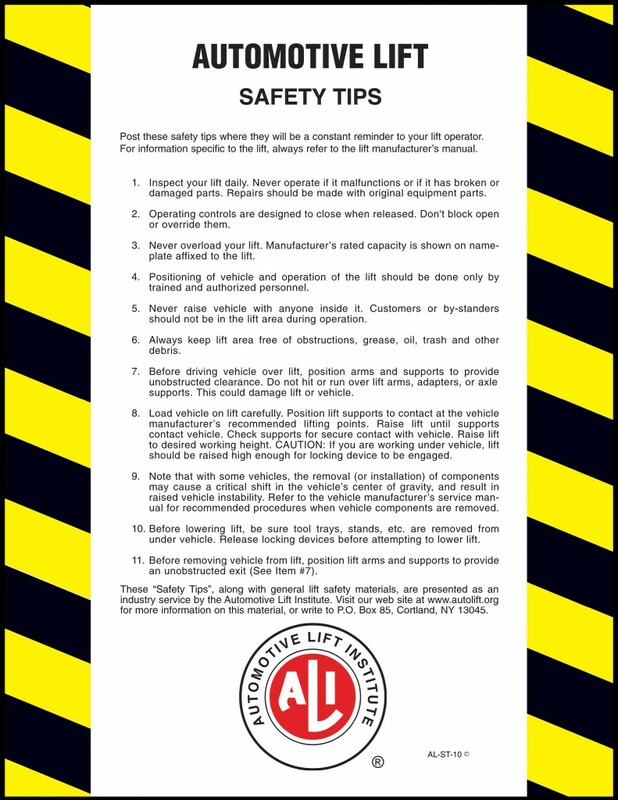 Fortunately, the Automotive Lift Institute provides us with a safety tips card which constantly reminds operators of the key safety precautions. Following these safety tips in addition to practicing good habits in the shop will help keep mechanic lift operators safe. The safety features on automotive lifts as well as these tips are there to allow less experienced mechanics to operate lifts in a safe manner. However, we are human and not perfect, therefore even an experienced mechanic could make a simple error which could prove to be detrimental. As a result to following these tips provided, you can help avoid any unnecessary damage or injury to yourself and others allowing for a much more smooth and safe shop. Daily inspections of your automotive lift helps identify if something is wrong BEFORE and incident occurs. Never operate lift with malfunctioning or broken parts. Make repairs with original equipment parts. Inspect cables at the start or end of each work day. Never prop open or override the operating controls. Only trained and authorized personnel should operate lift. Know the weight capacity and never overload lift being operated. Never operate lift with anybody inside the vehicle. Never disable overhead safety switch. Be sure vehicle is properly balanced at ALL times. Leaving a vehicle unbalanced is very dangerous even if you’re aware of it. Be sure cradle pads and truck adapter kits are used when applicable. Install power unit to passenger side for convenience. Keep lift area clean and free of obstructions before driving vehicle over lift. Check out 10 Tips on keeping a clean workspace. Load carefully and position lift supports at manufacturer’s recommended lifting points. Additions or removal of components cause a shift in the center of gravity of the vehicle. If this is the case refer to manufacturers service manual. Check supports to ensure secure contact with vehicle. Before lowering lift, again be sure area is unobstructed, and locking devices are released. Position lift arms and supports to create unobstructed are for vehicle to exit. In conclusion, whether you’re an experienced mechanic or just starting out, following safety precautions is imperative. By following the safety tips provided by ALI’s Safety Tip Card as well as other proper safety procedures at all times, you’re able to keep mechanic lift operators safe.